Facebook was made to connect people all over the world (that's why it is a social networking site) but obviously not all of us are comfortable with sharing their private information to strangers. Privacy settings is flexible enough to take control of the information we wanted to publish. Facebook keeps on changing their Privacy rules so its becoming complicated for not so savvy users. If your having a problem with new settings, here is an ebook manual by MakeUseOf which you can guide you with Facebook privacy. This manual is completely free and can be shared with your friends. Aside from knowing whether its raining or not, the website also shows you the current weather condition on that city. Having charts and graphs in PowerPoint presentation is helpful in explaining statistical facts and data. These charts are displayed as static images which you can put some animation using MS PowerPoint built-in animation tools. If the basic animations in PowerPoint does not meet your requirements, you can look into an alternate charting tool called Oomfo. It is a free plugin for MS PowerPoint that enables you to create Adobe Flash based animated charts. Here is a 3 minutes video to show you how Oomfo can create stunning animated charts. It has a simple wizard that guides you through the chart creation process. First you choose the chart type, enter the data, and insert the chart into your current PowerPoint slide. You can move the chart anywhere on the slide or re-size it to you preferred size. Oomfo supports all the recent versions of Microsoft Office including Office 2010. If you still don't know how to download your Facebook information on your local computer then keep on reading this article. Just recently, Facebook added a new button to copy your Facebook data to your computer. Just go to Account > Account Settings > Download Your Information. From the popup window, you will be able to download a zip file containing all your profile information, including your photos, wall posts, messages, videos, and other content. This zip file contains an HTML page of your profile with simple links to all of your data. Here is a short video demonstration of this Facebook feature. Normally whenever you click a video link, a new page will open to redirect you from the source of the video so you can watch it there. With a Google Chrome Extension called Video Viewer, you will be able to watch online videos right on the same page. Once installed, you just have to right click on a video link and click Watch Video to view the video in a popup. 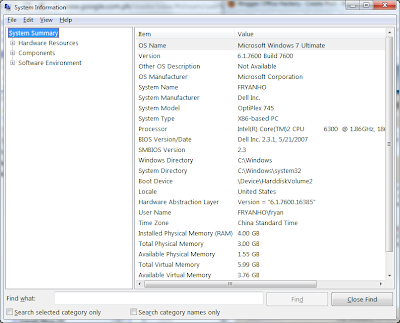 Although there are lot of tools in the internet that allows you to audit your hardware information thoroughly, Windows also have its own built-in tool. If you prefer not to download 3rd party tools then follow these easy steps to retrieve hardware info using Window's System Information. 1. Go to Start > Run or just press WinKey+R. 2. On the run dialog box, type msinfo32. 3. 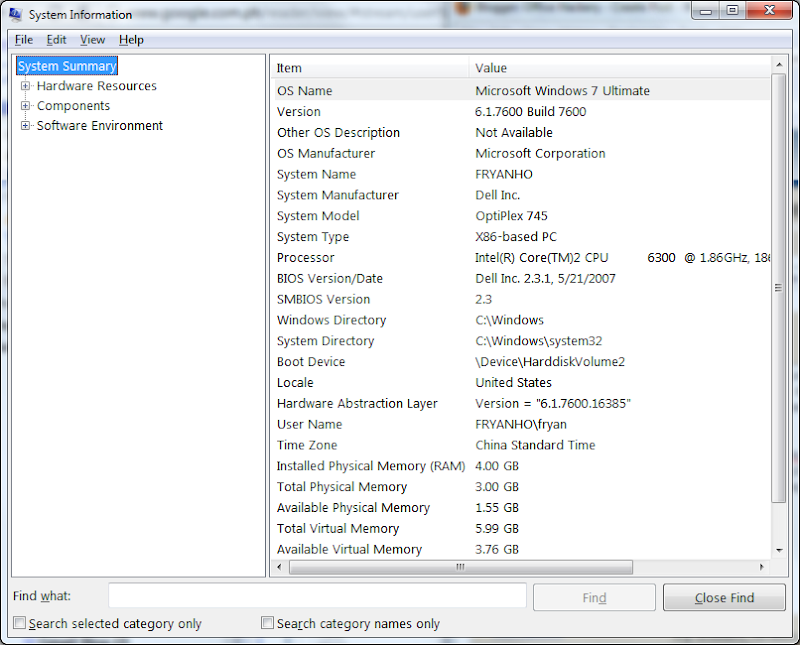 The System Information dialog will be shown. System Information is divided in to 3 categories: Hardware Resources, Components and Software Environment. YouTube is the primary source of internet users to download latest musics and videos. Usually you can transfer these online videos to local computer or portable devices by using a software and then convert the video to the format you like probably using a different tool. The download and conversion process can be simplify by using "Clip Converter". It is a free web service that allows you to convert and download nearly any audio or video URL to common format (MP3, AAC, WMA, MP4, OCG, AVI, MPG, etc.). It currently supports online video services such as YouTube, Google Video, Sevenload, MySpace, Dailymotion (HQ), Vimeo (HQ), Metacafe, MyVideo and more. If your not satisfied with the default sticky notes software of windows then I suggest keep on reading. I've been on search for an alternative sticky notes ever since I started using Windows 7. The default sticky notes feature of Windows is just not enough for me. Lucky me and probably luck you because I found a great alternative that is much more useful sticky notes application, the iQ-Notes. It is a feature-rich sticky note application for windows. One favorite feature of mine is the ability to set an alarm on the note so it pops up at a certain date and time. By default, Windows determines the speed it will use when copying files. This is not bad at all unless your using your computer for other heavy processing such as playing games or watching movies. Copying large files may peak up resources specially disk read and write operation. 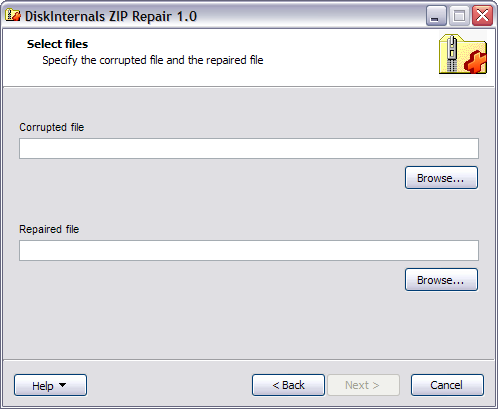 This is where UltraCopier comes handy because it allows you to replace the Windows default copy/move operation. Aside from adjusting the speed, it can also pause and resume the copy/move operation at will. It has a detailed debug logging so you can find out what went wrong in case of any failures. Since I upgraded to Windows 7, one feature I'm missing from Windows XP is the ability to minimize the taskbar. In Windows 7, the taskbar is always there, you can't just drag it down to free up some space on the desktop. Lucky ShellWin can do just that for us. ShellWin partially hide the Taskbar except the Start Button allowing you to keep the Start-button visible while running applications at full screen. Browsers today have built-in privacy feature which allows users to browse discretely. Leaving no trace of history and cookies on the browser. But if you have made to think that no one would ever know that you visited these sites then your wrong. Browsing in private mode only makes you invisible under the browser radar but not on Windows log. All website you visits are logged in Window's DNS cache and this is accessible in 3 easy steps. 1. Open command prompt. You located from the program menu or just press Winbutton + R then type cmd and enter key. 2. Type ipconfig /displaydns and hit enter. 3. This command will display all websites that have been stored in the DNS cache. Ofcourse there is a way to delete the content of DNS cache. On the command prompt, just type the following command and your trace will be deleted. Emails are the most common target of viruses and malwares because anyone can easily attached executable files that could be source of infection. By default, Outlook has built-in function to block some file formats (For example: exe, .url, .reg). When blocked Outlook, opening or saving these attachments is not possible. But with CodeTwo Attach Unblocker installed, you will be able to read all previously blocked attachments. To set the attachment types that should not be blocked, Go to Tools > Options in the top menu of Outlook 2007 and earlier. 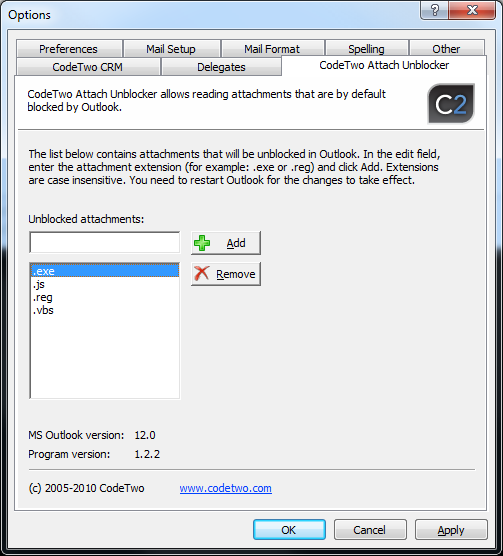 For Outlook 2010 go to menu and go to the CodeTwo Attach Unblocker tab. It works on Microsoft Outlook 2010 / 2007 / 2003 / 2002 / 2000 / 98.